Bitesized is a 2-sided platform that enables dietitians to extend their reach and have consistent, reliable connections with their clients. We all know dietary disease is rampant and diet change can be exceedingly difficult for many reasons including time, price, cultural tendencies, and ingrained habits. A dietitian can provide invaluable emotional support and practical guidance. Maintaining support is difficult: dietitians meet with clients sporadically (average: every 4 weeks). At an average appointment, they ask for a food log of the last 24-72 hours. Therefore, they don’t get a comprehensive understanding of their client’s diet, mandating generalized advice. Bitesized allows dietitians to gain a deeper grasp of their clients’ food habits, and provide personal, culturally-relevant, and specific recommendations on a consistent basis. A neuroscientist in pursuit of her PHD got excited when she heard about bitesized. She has been studying what creates optimal brain function, looking at factors of home/work life, community, stress, exercise, hobbies etc. She removed nutrition from her study, knowing it’s a key facet of an optimally functioning brain. She chose to remove it because methods for measuring food intake are largely inaccurate. 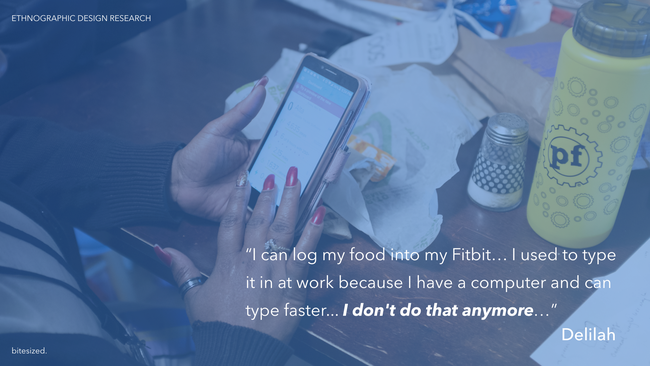 She liked bitesized because it documents users’ food intake directly before consumption. Methods of gauging food intake require some level of generalization. For a dietitian it is easier to generalize a plate of food than using a metric based approach according to ingredients. No food or person is identical. How food is cooked, quantity, freshness etc. all need to be considered. As new technologies progress were excited about the opportunities for increased accuracy using photo-analysis of food intake. The food system is in need of new life, methods, and systems. We produce food in a way that prioritizes efficiency and scale over personal and environmental health. Prioritizing efficiency in food production creates inefficiency in our population. The more we process foods, the less our bodies benefit. It’s an ironic cycle. However, advice from a dietitian will inherently be encouraging users to buy foods that are better for the environment. Drawdown.org claims to have the most comprehensive plan ever proposed to reverse climate change. A plant-rich diet is the #4 most impactful thing we can do according to their list of solutions. Based on a dietitian’s education they will steer people towards leaner and less meats, as well as more whole grains and vegetables. Please suspend your current mental model of “Next-Generation” for a moment. This is requested because we want to challenge the value an algorithm can provide when it comes to behavior change. The multiplicity of factors that weigh on each person’s food choices is hard to overcome alone without an external source of perspective, advice and accountability. For this reason, we are challenging the validity of purely technological solutions and are using technology to support human relation as opposed to technological solutions replacing human relation. Bitesized will not fully utilize gigabit technology for Version1. In future, we want to implement a Dietitian/Client video chat feature. To ground the interaction in the value that human-to-human support provides, video chatting is an excellent tool for cultivating rapport and empathy between Dietitian and Client. Bitesized will use geo-location to ping its users at key moments. When they pull up to a store for a routine shopping or eating trip, there is likely a recommendation from the dietitian at that location. The app has to access that specific package of information issued by the dietitian and deliver it in a timely manner for the app to be effective. The goal is to remind clients of their goals in the moments that matter. For example, when pulling up to Taco Bell, most people could use some guidance. In this model of dietary support there are all new potentials for utilizing the available data sources provided by Smart Watches. The details will be kept confidential for now. Yes, we said it. The buzz word. AI has many potentials for supporting the dietitian with their work in bringing efficiency and customization to the table. Again, we will keep the details confidential for now. Bitesized was designed by a team of Interaction Designers (UX, UI, Product Management) recently graduated from the Austin Center for Design, class of 2017, in Interaction Design and Social Entrepreneurship. AC4D is a high-caliber, high-demand course of study that guided us through the rigorous phases of building an empathetic digital product that solves a real problem. We are now ready to put those thoughtful decisions into code. We have momentum. Outside of school, the designing team have backgrounds in digital product design, both in an agency and in-house, cultural anthropology, start-up life, design thinking and non-profits. 2 members of the team decided to pursue jobs in the design industry. In respect for their efforts and input, thank you to Sally Hall and Conner Drew. The remaining member, Elijah Parker, has recruited 2 developers to bring the design to life. Elijah is an Interaction Designer with a background in people watching. Some call it Anthropology. He has worked with a VC funded start-up that failed and has seen, first-hand, the importance of staying true to the core mission of a product. Before becoming interested in technology and attending the Austin Center for Design he co-designed and built the interior of Wanderlust Yoga, Idean Austin, Treehouse Inc. and Blenders&Bowls with Panda Creative Studio. He sits on the board of directors of the Amala Foundation, an organization focused on youth leadership and cultural exchange where he co-founded the Youth Innovation Council; a skill building program for young people ages 16-19. Chap is a Senior Full-Stack Developer, UX Designer, and Product Manager. He has worked on dozens of web apps over the last ten years. He also has experience building mobile apps, interactive installations, and a hardware product. He has helped build and launch products for VC funded startups, national nonprofits, and businesses of all sizes. Chap has a BFA in Industrial Design with a minor in Interaction Design (2006). He is certified by the Austin Center for Design in Interaction Design and Social Entrepreneurship (2011). Kirby is Co-owner and Head Developer at Eye Like Design, a local shop that provides quality web development services to many organizations in Austin. Kirby built his first website at 12 years old and has been building his technical skills and perspective ever since. In our focus population, the constraint is not access to technology, the issue is price point. We think, like Tesla and others, we must start at the high end of the market. In the future, once the effectiveness of the system has been proven we hope to be able to quantify that proof in a way that big insurance plans will subsidize the usage of the app. An intermediary step to integration with the healthcare systems in Austin is to target non-profits and foundations who focus on underserved communities, especially those that already employ dietitians which would allow us to cut our costs. We plan on building a hybrid app which means we can reach users on both Android and iOS devices. We have also discussed a version of a Tom’s model but, again, that will not be possible before a certain level of scale. We have a UI design grounded in UX design research and are ready for development. ~85% of the prize money would go towards literal lines of code being written. We will build the basic Alpha and launch it. Following the Alpha, the developers will begin on the full MVP as the Alpha runs in tandem. We will iterate the MVP design as we learn from the usage patterns of the Alpha. The other ~15% will go to the founding member’s time for oversight of development, running the Alpha pilot, answering developer questions and solving issues that come up that may not have been thought through yet; things like error messages, working out details in our notification strategy and timing of animated components etc.